Moscow’s three largest airports may merge into a single organization, which would eventually be privatized, but experts fear that the planned consolidation will have a negative impact on competition. For the past several years, Moscow’s three biggest airports, Sheremyetevo, Domodedovo and Vnukovo, have been competing with each other for both passengers and airlines. Although this is common practice in many other countries, it has been a learning experience in the Russian capital. During the Soviet era, the three served different purposes: Sheremetyevo was the main international airport and the largest one in the country; Domodedovo was planned as a hub airport for long-haul flights to Siberia, the Far East and Central Asia, and it also served medium-haul flights to the Volga Region and Ural; Vnukovo traditionally served flights to Ukraine and Black Sea resorts. But with the end of the Soviet Union, Sheremetyevo remained the property of the state, while 75 percent of Vnukovo was transferred to the Moscow City Government, and Domodedovo became a private enterprise managed by the East Line Group. In recent years, Domodedovo emerged as the leader in passenger traffic among Russian airports. In 2011, Domodedovo served 25.7 million passengers, Sheremetyevo – 22.6 million passengers and Vnukovo – 8.2 million passengers. Domodedovo now serves about 46 percent of Moscow passengers, Sheremetyevo – 40 percent and Vnukovo – 14 percent. Meanwhile, the real goal of the airport merger began to trickle out as early as January 2011. Market experts are certain that the decision to merge the Moscow airports was brought about by the desire of government officials to sell state-owned assets to the highest bidder. According to Minister of Transport Igor Levitin, some foreign companies are already willing to negotiate on the subject with the Russian authorities. “We got offers from big European operators, from Southeast Asia, from an operator of an airport in Singapore and American operators as well,” Levitin said. Consolidating the airports’ assets turned out to be a difficult task, partially due to the fact that the ownership structure of each airport is extremely tangled. In May 2011, the shareholders of Sheremetyevo stated that they had eliminated all the disagreements in the appraisal of the airport complex and of the modern D terminal – which is under control of an Aeroflot subsidiary – thus removing all obstacles to the consolidation of shares. Nevertheless, the consolidation was finished on April 2, 2012. After the Terminal Company’s accession, the government’s share in Sheremetyvo was decreased almost to 83 percent, Aeroflot got about 9 percent of assets and while two government banks - Vneshekonombank and VTB – took approximately 4 percent of assets. For its part, Vnukovo’s ownership structure is no less complex. A part of the airport’s property belongs to companies whose main shareholder is a group of private investors headed by businessman Vitaly Vantsev. He does not insist on the state buying out his share, and is willing to exchange it for shares of the consolidated company. But the state would prefer to have Vantsev out of the way and plans to introduce some amendments to the law in order to eliminate the need to buy him out. The final stage of the Moscow air hub consolidation should be the takeover of the largest airport – Domodedovo, as Shuvalov announced in 2010. State officials have never explained how the state plans to take control over the airport, but the airport’s owner, the East Line group, is already willing to sell. In May 2011 Domodedovo attempted to launch an IPO, but it was cancelled at the last minute. Last fall, East Line began searching for buyers for the entire airport, but was unable to find anyone willing to pay the reported $5 billion price tag. However in March the Summa investment company started negotiating with stated-owned Sberbank (Russia’s largest bank) about the $ 2 billion loan to buy the airport. Meanwhile, in early April another investment company A1 – the department of the Alfa-group consortium – submitted application for a loan from Vneshekonombank to buy the airport. Both of A1 and Summa are ready to pay $ 3 billion dollars for Domodedovo. The airport price could decrease due to the terrorism attack that took place at Domodedovo in January 2011, which resulted in the deaths of 37 people. The attack forced the state to take a closer look at Domodedovo’s management, and the airport’s owners were severely criticized for its insufficient safety measures as well as their company’s registration outside Russia in a well-known tax haven. In addition, the Ministry of Transport limited the airport’s development plans, including the construction of a third runway. At the same time a decision was made to reconstruct one of the two strips which are currently in operation by the end of 2014 at the latest. As a result, Moscow’s largest airport will temporarily have only one strip and may not be able to efficiently handle its passenger traffic. This could lead to airlines departing for Vnukovo, where a new terminal has recently opened, or Sheremetyevo, where a third landing strip is already being constructed. In February, Sheremetyevo topped Domodedovo in terms of passenger traffic. Analysts and experts have identified a couple of possible scenarios for the future. One is that, when transferred to new owners, Domodedovo will continue to develop independently and compete with a consolidated Sheremetyevo/Vnukovo. Another is that the new owners who have expressed interest in buying Domodedovo will do so and prove a more willing negotiator with the government, at which point the merger will go through. 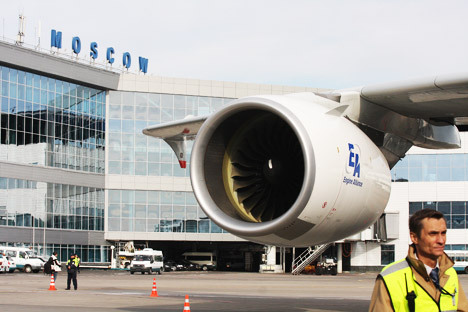 Alexei Komarov, chairman of the editorial council of "Aviatransportnoye Obozreniye" ("The Air-trasport Review"), believes that preserving competition at the Moscow air hub would be good for civil aviation. “The transfer of all the airports into a single ownership is fraught with serious risks. If the management turns out to be inefficient, it will affect all the three airports at once, but at that time it will already be impossible to turn the situation back,” Komarov said. He also notes that this is not the first time the government has attempted to consolidate state assets in aviation, and all the previous ones have ended with a failure. The most notorious of these was the Rosavia project, in which the government tried to create a competitor to Aeroflot by merging six state carriers. Corporate procedures took so long and the airlines’ performance worsened so dramatically, that the only salvation for them was to transfer the assets to Aeroflot. Kirill Slepynin and Aleksey Ekimovsky are the authors for market guide “Russian Transport”.